We are a week removed from Miguel Cotto’s shocking destruction of Sergio Martinez, and the options for the Puerto Rican star are aplenty. Cotto is slated for a December ring return, either in New York or Las Vegas, and has a bevy of potential foes floating around between 154 and 160 pounds. Some people have expressed interest in a rematch between Cotto and Floyd Mayweather. Two years ago in Las Vegas, Mayweather beat Cotto via a unanimous decision in the face of a strong effort from Miguel. Cotto looks as focused as ever since linking up with trainer Freddie Roach, so the intrigue in a second encounter is there. 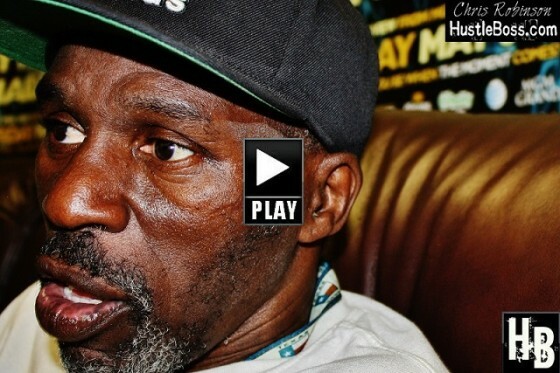 HustleBoss.com’s Chris Robinson speaks with trainer Floyd Mayweather Sr. about Miguel Cotto’s destructive stoppage victory over Sergio Martinez on Saturday night. Exclusive photos from photographer Naoki Fukuda as Puerto Rico’s Miguel Cotto (39-4, 32 KO’s) halts Argentina’s Sergio Martinez (51-3-2, 28 KO’s) after nine rounds to claim the WBC middleweight championship. Photos from Madison Square Garden in New York as Puerto Rico’s Miguel Cotto (39-4, 32 KO’s) belts out a punishing beating to Argentina’s Sergio Martinez to capture the WBC middleweight champion. 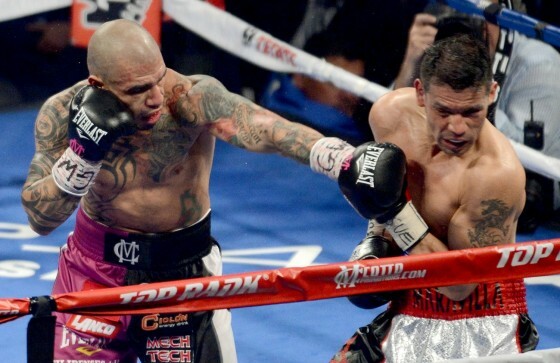 Cotto dropped Martinez (51-3-2, 28 KO’s) three times in the first round and controlled the action througout, with Sergio’s corner electing to stop the match after nine rounds. Photos from Madison Square Garden in New York as three-division world champion Miguel Cotto (155 pounds) of Puerto Rico and WBC middleweight champion Sergio Martinez (158.8) of Argentina both make weight ahead of their HBO pay per view clash. 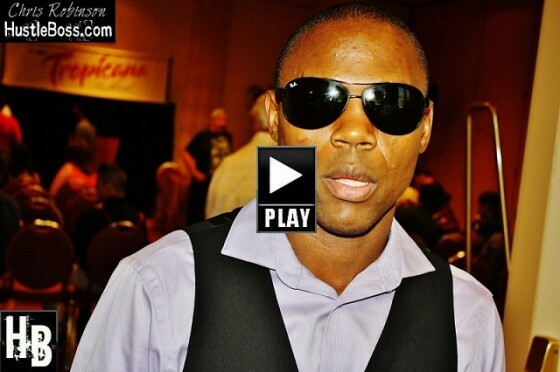 HustleBoss.com’s Chris Robinson catches up with Junior lightweight contender Javier Fortuna (24-0-1, 18 KO’s), as he discusses his 5/31 return to the ring vs. Juan Antonio Rodriguez as well as his stable mate Sergio Martinez’s June 7 clash vs. Miguel Cotto. Please check out the official HBO Face Off between former three-division world champion Miguel Cotto and reigning WBC middleweight champion Sergio Martinez, as seen below. For the past six weeks, lightweight prospect Lydell Rhodes has been a key figure in the training camp of eight-division world titlist Manny Pacquiao ahead of his April 12 rematch with Tim Bradley. Rhodes, originally from Oklahoma and now residing in Las Vegas, first made the trek to General Santos City, Philippines for the initial leg of camp before shifting to Los Angeles, where he has been soaking up the atmosphere while also serving as a chief sparring partner to Pacquiao at the Wild Card Boxing Club. After hitting up famed gym, Rhodes instantly felt at home. Boxing reporters, including BoxingScene.com’s Luis Sandoval, speak with former three-division world champion Miguel Cotto about his upcoming June 7th clash vs. Sergio Martinez. HustleBoss.com’s Chris Robinson speaks with Top Rank CEO Bob Arum about the Manny Pacquiao vs. Tim Bradley rematch, his recent work with Miguel Cotto, and the challenge Cotto faces in Sergio Martinez on June 7. HustleBoss.com catches up with some fighters from the Mayweather Boxing Club in Las Vegas, Nevada, including Andrew Tabiti, Bryce Fraser, Tino Edens, Lanell Bellows, Cortez Bey, and Luis Arias, to discuss the June 7 Miguel Cotto vs. Sergio Martinez matchup on HBO pay per view. HustleBoss.com’s Chris Robinson speaks with former IBF junior middleweight champion Raul Marquez about the upcoming June 7 mach between WBC middleweight champion Sergio Martinez and Puerto Rico’s Miguel Cotto. Miguel Cotto set to hit the Philippines on Monday to start training and sparring with Manny Pacquiao? Sources close to the situation have informed HustleBoss.com that Miguel Cotto is set to join Manny Pacquiao in General Santos City, Philippines next week ahead of each man’s respective pay per view clashes in the coming months. Click the thumbnail for more information. HustleBoss.com’s Chris Robinson speaks with former world title challenger Marco Antonio Rubio inside of the Robert Garcia Boxing Academy in Oxnard, Calif. as he gives his personal view of the forthcoming Sergio Martinez vs. Miguel Cotto clash. HustleBoss.com speaks with boxing advisor Gaby Penagaricano inside of the Beverly Hills Hotel in Los Angeles as he discusses the Manny Pacquiao vs. Tim Bradley rematch, Sergio Martinez vs. Miguel Cotto, and what Floyd Mayweather’s options are. HustleBoss.com’s Chris Robinson and other media members speak with always-outspoken former welterweight and junior middleweight champion Ricardo Mayorga, as he discusses the upcoming Sergio Martinez vs. Miguel Cotto matchup and other topics. HustleBoss.com’s Chris Robinson speaks with former middleweight title challenger Kofi Jantuah as he breaks down the possible match between WBC middleweight champion Sergio Martinez and Puerto Rico’s Miguel Cotto. Chris Robinson speaks with boxing great Roy Jones Jr. during Jean Pascal’s training camp in Big Bear, Calif. ahead of his HBO date vs. Lucian Bute. 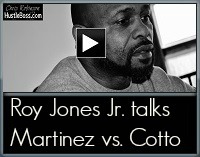 Click the thumbnail for more, as Jones breaks down several key aspects of the recently-discussed Sergio Martinez vs. Miguel Cotto clash.